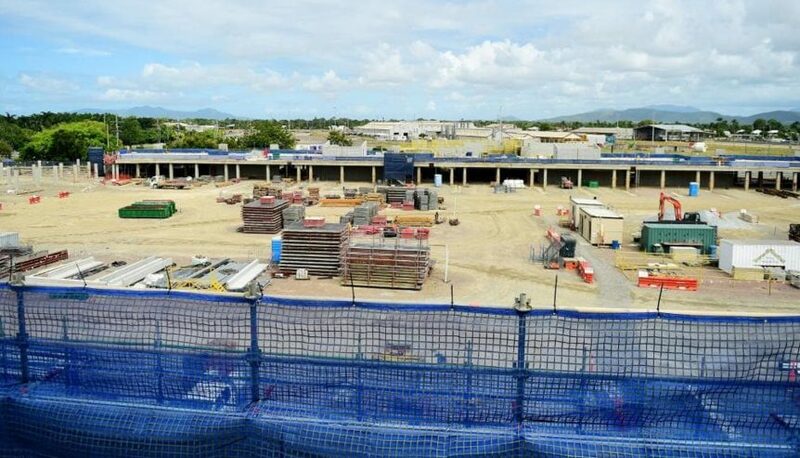 Workers are beginning to envision play on the North Queensland Stadium as it starts to take shape around them, with the project on track to be completed for the start of the 2020 NRL season. Watpac project manager Brian Hayes said progress was “on program” with the western grandstand currently the focus of most work. Level three concrete pours on the western stand were now complete and preparations were under way for level four, which will get started next week. North Queensland Stadium Project Manager Brian Hayes with Steel Fixing Supervisor Blinky Hartt, Project Engineer Ashley Foster and Metalrig’s Brad Turner. “Level one and level two we are starting to do the internal fit-out,” Mr Hayes said. Work is also under way on the northern, eastern and southern stands. A Queensland Government spokeswoman said the fifth set of twin rakers that would support the lower portion of the upper seating bowl was being installed on the southern stand. “It is expected the installation of concrete seating platforms in the southern stand will commence within the next month,” the spokesman said. View from level 2 of 5 in the Western Stand at the North Queensland Stadium. Already 8000 cubic metres of concrete have been poured on the project, as well as a total of 50,000 concrete blocks laid by locals. About 650 tonnes of structural steel has been fabricated for the western stand, while the southern and eastern stands to date have had 100 tonnes. The first escalator, which will take people high into the western stand, was installed by crane on Thursday. It was hoped work would be finished on the grandstand by mid-March, Mr Hayes said. The next challenge would be the roof of the stadium, which would get under way in March and April. “Once you start seeing these upper bowl rakers go up, and start to see it on the east, you’ll start to feel the actual stadium start then to close around you,” Mr Hayes said.